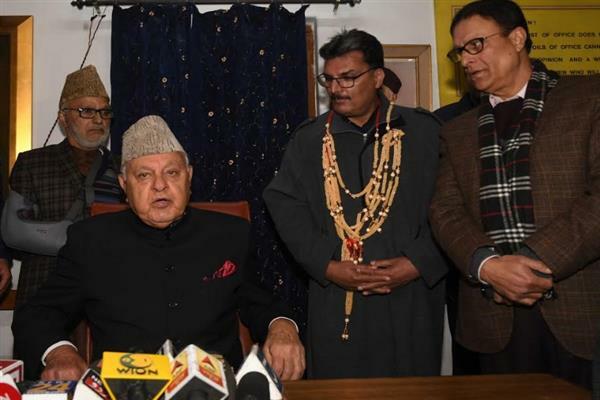 Srinagar, Mar 08 : Former chief minister and National Conference (NC) patron, Dr. Farooq Abdullah on Friday said that repressive measures and arrests in Jammu and Kashmir won’t yield any results, saying that dialogue is the only way to resolve issues. Dr. Abdullah added that repressive measures won’t prove effective to normalize situation in Kashmir. “Banning socio-religious out fits also won’t help. During Jagmohan’s time JeI was banned, their schools and institutions were ceased. What was then governor able to achieve by banning JeI? Eventually they had to hold parleys with them. It is therefore reconciliation and rapprochement only that will solve all the contentious issues,” he said. “Minorities in the country are feeling alienated and threatened more than ever. It’s for the PM to address these concerns immediately and put a sense of security among all,” he added. He added it is high time for both India and Pakistan to find a solution to the protracted political issue of J&K by giving autonomy to J&K on either sides of the divide. Among others NC General Secretary Haji Ali Muhammad Sagar, Provincial President Nasir Aslam Wani, State Secretary Choudhary Muhammad Ramzan, North Zone president Muhammad Akbar Lone and YNC vice president Ahsan Pardesi were also present.